Primed for the rush of last minute gifting is this Russell Stover Hearts Valentine’s Day Tower. Positioned at the store entry it is a good reminder of the pending Holiday in itself. The Corrugated Tower allows presentation of shelf-top-size carriers of the Hearts. So the shelf-top units serve multiple merchandising purposes. Consider all in the gallery of slideshow images. 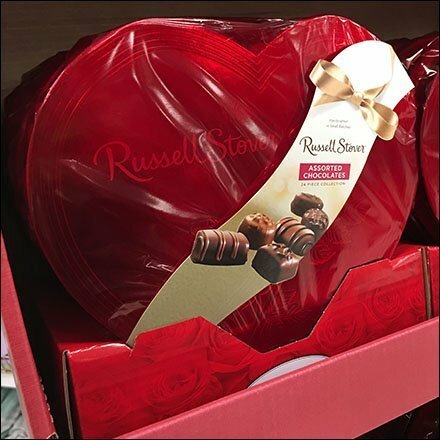 This Russell Stover Hearts Valentine’s Day Tower seen at Target.